The following describes the evolution of my Lean leadership training courses. I began teaching Lean leadership to executives in 2002 (and to university students since 2001, based on my work published in 1998). The first generation started as a half-day training course that consisted mostly of lecture focused on Lean leadership behaviors. Feedback from early participants led to three types of improvements: Clarity and simplicity of presentation materials, less lecture, and more practical hands-on exercises. These improvements resulted in much better training courses, and were expanded to one and two days in duration. While the participants were satisfied, the outcome was less than what I expected. Executives had difficulty translating what they learned into new leadership behaviors on-the-job. Why? One problem with this first generation training course was that my efforts to make the material easier to understand made the material less challenging for participants. When the training material is less challenging, leaders develop the sense that they already know it. As a result, they don’t put into daily practice what they learned in the training course. They go back to work and lead in the same ways, more or less, as before. I also realized there was a significant problem with Lean leadership training that focused on behaviors: It treats the symptoms of problems. While such training courses accurately convey information and practices, the underlying cause of non-Lean leadership behaviors goes unaddressed. The vast majority of Lean leadership training offered today is first generation and has yet to evolve from conveying information and telling people how to become a better leader. In 2006, I created a second generation Lean leadership course that transitioned from a lecture course to a workshop, and functioned more as an intervention. This workhop focused on the causes of non-Lean leadership behaviors and the precise connections between leadership beliefs, behaviors, and competencies – with detailed examples for both conventional leaders and Lean leaders. The training was far more hands on and challenging (brain-on) for executives. It had a much stronger impact on them because it exposed dozens of causal relationships that they could clearly understand and personally relate to. It was a great revelation to them. The workshop evolved and improved over time and fared well in the marketplace, but I wanted to create something more effective. Instead of treating symptoms, the Lean Leadership Laboratory emphasizes prevention – prevention of the causes that reduce both leadership (individual) and organizational effectiveness. You may notice a similarity to the evolution of how medical doctors treat patients, from addressing symptoms to the prevention of disease and disability. In the case of Lean leadership, “prevention of disease and disability” means to prevent illnesses that disable organizations’ ability to respond to changes which, in turn, reduces their competitiveness, and to improve the overall health of the organization – including all the people in it. 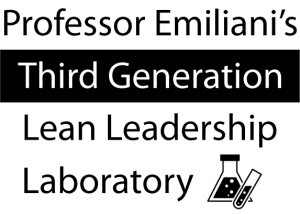 My third generation Lean Leadership Laboratory has no lecture and no PowerPoint. And it is designed to do something that no first or second generation Lean leadership training course can do: Simultaneously improve business health and human health. Click on image to view workshop flyer. Click on the image to learn about the Lean Leadership Laboratory (a two-page .pdf file). Notice that it refers to participants – executives – as “students,” and it uses the term “Lab Class” for each day of the laboratory to convey a student-teacher relationship and a preponderance of hands-on learning. The Lean Leadership Laboratory requires executives to do homework prior to each class. The first one-day laboratory class is focused on Lean leadership beliefs, behaviors, and competencies, followed by a second one-day laboratory class a month or so later focused on leadership processes. My role in the two laboratory classes is to facilitate hands-on learning, with a determined focus on retention of the learning and post-laboratory application and practice. This is a unique offering that can finally achieve what has not been achieved in the past. Please contact me if you would like to schedule a Lean Leadership Laboratory for your organization.